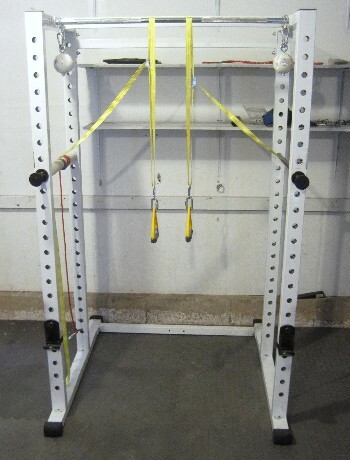 It has been over six months since I wrote about the homemade suspension trainer.Â The original unit has been used regularly since January and is still as good as new.Â It has certainly proved to be a useful DIY project.Â I also appreciate all of the comments posted to the original entry.Â Several readers shared ideas and modifications when constructing their own units. Within this follow up entry, I will discuss a few of the more commonly asked about modifications.Â To begin, several readers have asked about single vs. double point attachments.Â In the original entry, I demonstrated a single point attachment model.Â The unit therefore resembles an upside down Y (similar to: â…„).Â Perhaps the greatest advantage of the single point model is that it is faster to make height adjustments, as you only need to adjust the top strap.Â One disadvantage is that the straps tend to be a bit rough on the arms when performing exercises such as dips. 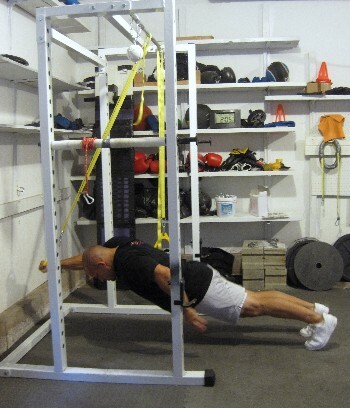 The single point also isn’t as convenient when performing unilateral exercises (discussed later in this entry). 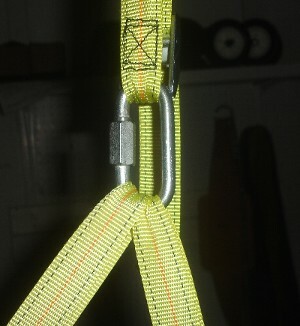 Fortunately, it is quite easy and inexpensive to construct a double point attachment model.Â All that you’ll need are lashing straps and handles.Â The final product is similar to commercial products such as gymnastic rings and blast straps. 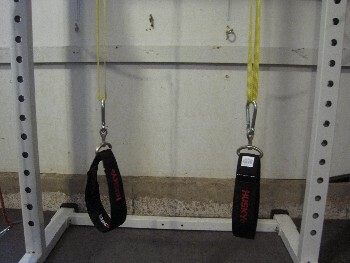 If you need straps for your suspension trainer, strapworks.com offers an inexpensive, yet durable option (as mentioned here). 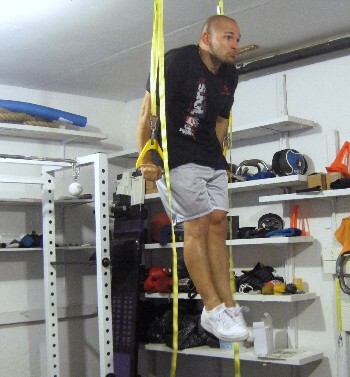 As you can see above, the straps are independent of each other.Â Â These straps are therefore much more useful for exercises such as dips and muscle-ups. The double attachment also makes these straps more useful for unilateral exercises.Â Simply slide the second strap out of the way. Below you can see how I perform a single arm rollout without any interference from the second strap.Â Once again, each strap is independent, so one does not connect or interfere with another. 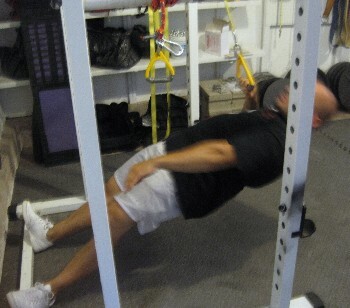 Single arm body rows are just one of many more unilateral options. 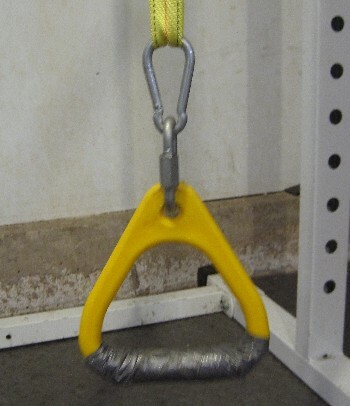 Another commonly asked question about the original entry was in regards to the homemade handles.Â Many readers were interested in other handle options.Â For this entry, I’ve used triangular playground rings. I’ve had these handles for over 5 years now.Â They are easy to find at playground equipment suppliers.Â The tape that’s been added to my handles was added a few years ago to increase thickness.Â It certainly isn’t necessary to add the tape. Another common question following the first entry was in regards to knot tying for the homemade handles and foot straps.Â By using triangular rings, you won’t need to tie any knots.Â The handles attach to the lashing straps via a spring link and quick-link connector (another option for handles would be DIY rings). As for the foot straps seen within the original entry, I came across a useful alternative by accident.Â I was hanging something in my garage from a Husky Hang-All and realized that it would work well as a foot strap.Â I returned to Home Depot to purchase another and paid approximately $6.50.Â Each Hang-All includes a spring link connector so they can attach directly to each lashing strap. You can quickly adjust the velcro for a custom fit foot strap.Â DIY foot straps should be easy to make as well (ex. using your own velcro strips). Although this entry is new, I’m actually more familiar with double point attachment straps.Â I first built something similar several years ago.Â It is difficult for me to say which style (single vs. double) is better however, as both have pros and cons.Â Personally, I’m glad to have built both.Â Each project is fairly inexpensive and I get plenty of use with each version. 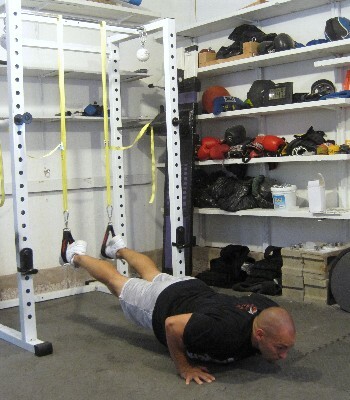 Therefore, if you plan to build only one, consider which exercises you wish to perform and where you wish to attach the straps.Â Make your decision accordingly.Â Either way, you should have a long lasting piece of equipment that can be quite challenging and beneficial. totally awesome piece of equipment, Ross! Thanks Ross! This was exactly what I was looking for recently. Nice set-up, Ross. The garage in our new home is small, so this design is perfect. I got my handles from Lowes or Home Depot years ago for next to nothing, and they are still intact. Thanks for posting this. I’ve been so close to rigging one up myself, and your pictures helped me put it together how I can do this from a tree in my back yard. Hey Ross – I debated whether or not to even post this, since it is my first comment and might be construed as self-promotion, but this is just to good a coincidence for me to pass on. You and I must be on the same wave length or something, because I just posted a YouTube video a few days ago about why I consider TRX straps as nothing more than extremely overpriced, adjustable canvas straps. And how I use mover’s straps (Used by professional movers) to get the job dome a lot cheaper. Your blog is in my RSS feed, but I must have missed your first post about this idea. Anyways, good post…and here’s my take on home-made straps. Thanks for the posting. It’s amazing how a little creativity and sweat equity can save about $160 lol. 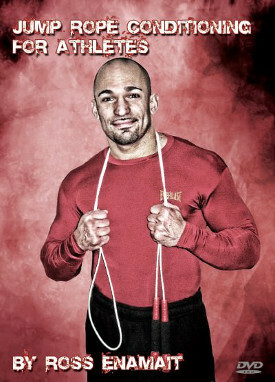 Most of my workouts are equipment free. I will definitely take some advice from this article and share it. What length of strap do you usually buy? Hi Ross, I tried to find your solution to the suspension strap that comes with the trx… So that you can wrap it around a tree or whatnot, but couldn’t find it. Any suggestions? Thanks again for such a great site! Your passion is obvious! You can purchase straps from a site such as strapworks.com. I demoed them in the DIY gymnastic ring video.